For those who know me, would tell you how much I love hoarding collecting perfumes. And for those who doesn't, now you do. I am very particular when it comes to choosing a perfume. I go for mild and delicate or say ‘not so strong’ kind of smell. This time, the pretty Dolce Floral drops caught my attention and I had to give it a try. The scent is light and fresh with a twist of sweet yet dewy and soothing texture. Going by my preference, I love fragrances which are feminine and sweet, yet a spray and it should stay for long. D&G Floral drops comes in a thick glass, curved lines, and solid bottom, the cap is sculpted in the shape of a white flower with petals, the bottle is a frosted glass which gives it a misty green colour. 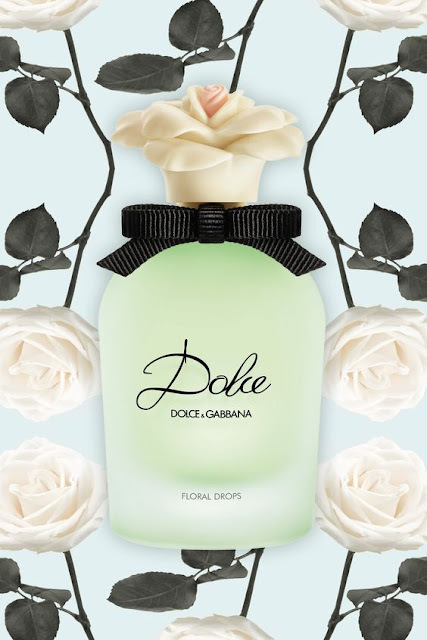 Subtle with a hint of fresh floral, “it is inspired by the notes of Dolce Eau de Parfum, with its signature of white flowers.” 'Dolce Floral drops' is lively and delicate, it is refreshing and I fell in love with the scent the moment I opened the green misty bottle. It is slightly light and aquatic, so for those who prefer strong smell won’t like the mildness. Also, the scent doesn’t last that long, however, it will be just perfect for the upcoming spring! The Top notes are neroli leaf and papaya flower. The Heart notes of amaryllis, daffodils and water lily. The Base notes are cashmere, musk and sandalwood. Notes: Neroli Leaves, White Amaryllis Flower, Musk.